Magnitogorsk is an industrial city in Chelyabinsk Oblast, Russia, located on the eastern side of the Ural Mountains. The city was founded in 1743, but it remained insignificant until about 1929. The rapid development of Magnitogorsk stood at the forefront of Joseph Stalin's industrialization strategy in the 1930s. Several hundred foreign specialists were invited to direct the work, but in 1937 foreigners were told to exit and Magnitogorsk was declared a closed city. The city played an important role during World War II because it supplied much of the steel for the Soviet war machine. During perestroika the closed city status was removed and foreigners were allowed to visit the city again. Magnitogorsk Iron and Steel Works, abbreviated as MMK, is the third largest steel company in Russia. 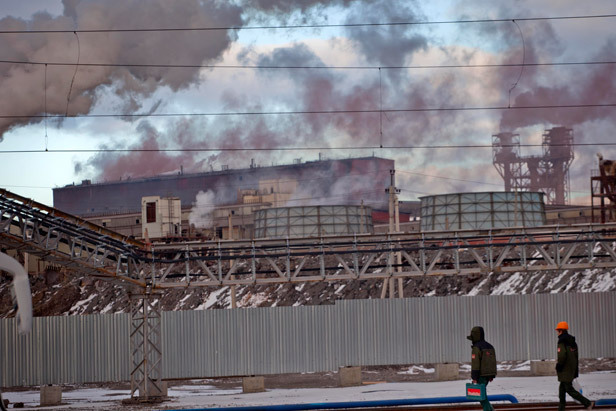 But because of the factory Magnitogorsk is one of the world's worst polluted cities. MMK is also known for being one of the major sponsors of the new Kontinental Hockey League. Metallurg Magnitogorsk is an ice hockey team based in Magnitogorsk, playing in the KHL. Evgeni Malkin and Nikolai Kulemin both play for the club and both are Magnitogorsk natives.